With weather warming up, grilling season is well on its way, and nothing tastes better fresh off the grill to me than a juicy steak. Here, I will present two ways to top off your steak: a cabernet balsamic sauce from Guy Fieri or blue cheese & chive butter. Both these steak recipes will go great with a bottle of Cabernet Sauvignon. 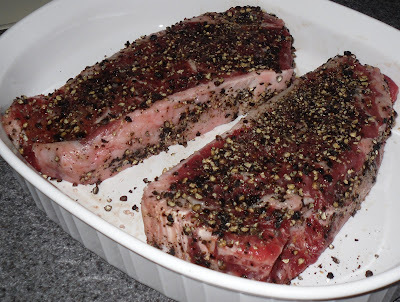 ﻿This recipe begins with 2 new york strip steaks, dusted with a mixture of 4 tablespoons lightly cracked black peppercorns and 2 tablespoons kosher salt and pressed into the steak with the palm of your hand. Let these steaks marinate for at least 4 hours in the fridge before grilling, but no more than 8 hours. Cook/grill/broil steaks according to your preference and desired doneness. 1. In a medium sauce pan over medium heat, add extra-virgin olive oil and onions and lightly saute until onions are caramelized. 3. Deglaze with wine and balsamic vinegar. Add sugar and let simmer and reduce for 20 to 30 minutes until mixture reduces to 3/4 cup. 3. Strain wine mixture and return to heat to reduce for 5 more minutes or until thick syrup is created. Serve with the steaks. Cook's notes: I had a lot of trouble getting this sauce to reduce, so I eventually gave up, but it was still just as delicious. I also did not strain the sauce and left the red onion and garlic bits in there as I poured it onto my steak. 1. Make sure butter is softened. Combine all ingredients and mix until well incorporated. 2. Place desired amount onto steak, while it is still hot, so blue cheese butter may melt onto meat.